November 1, 2013 is National Cook for Your Pets Day, so tonight pet parents across the country will enjoy a nice home-cooked meal with their canine, feline, and critter companions. With problems involving China-made jerky treats and obesity, pet owners are encouraged to make meals for their pets Nov. 1. In the wake of so many national pet food recalls and the infamous made-in-China jerky treat debacle under investigation by the Food and Drug Administration (FDA), many pet owners are starting to get curious about making the switch to a homemade diet. But how does a novice pet chef get his or her start? Cookforyourpets.com is urging all pet owners to take this National Cook for Your Pets Day as an opportunity to learn the facts about at-home meal prep for their pets — and maybe even try cooking a meal or two for their furry friends. 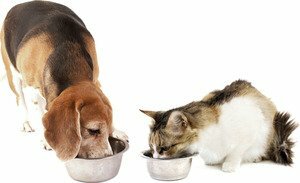 Because dogs are selective carnivores — meaning they eat a diet made up of primarily proteins but also eat a few grains, fruits, and veggies — preparing a meal for Fido can be a bit easier than cooking up something for your strictly carnivorous kitty. There are, however, a number of foods you should avoid when cooking for your dog or cat. While not toxic to all dogs, eating a significant amount of grapes or raisins can cause rapid renal failure. Avocadoes, macadamia nuts, mushrooms, and walnuts should never be an ingredient used when prepping a meal for a dog or cat. Onions, leeks, and chives are big no-nos for both cats and dogs; these members of the allium family contain sulfurs that can negatively react with red blood cell membranes, causing them to explode. Eating enough of these can prove toxic. And while many recipes for homemade dog treats and food call for garlic, garlic is another member of the allium family and should actually be avoided — after all, it’s always better to be safe than sorry. You may be a chocoholic, but when you’re making a meal for your four-legged friends this evening, skip the chocolate mousse. Whether you’re making a delicious dish for your dog or your cat, remember that chocolate can be toxic to pets. Chocolate contains an alkaloid called theobromine — a stimulant that can be difficult for dogs, cats, and even horses to metabolize. Too much of this substance can have some pretty nasty effects, including diarrhea, vomiting, muscle twitching, dehydration, rapid heart rate, and even seizures. And if you were thinking about adding a big brick of cheese or a tasty saucer of milk into the mix, think again: any milk or milk-based products can give Fido and Fluffy a serious tummy ache. Finally, a nice frosty beer might sound awesome to you, but this National Cook for Your Pet Day make sure you are the only one consuming any alcohol; alcoholic beverages in any amount can prove lethal for pets of all species and sizes. If National Cook for Your Pet Day inspires you to permanently make the switch from store-bought pet foods to homemade, there are some important things to consider. First, it is important that homemade pet diets are balanced to keep Fido and Fluffy healthy. Consult a trusted veterinarian about what to feed your pet and in what amounts to be on the safe side. Your veterinarian may even recommend a consult with a veterinary nutrition specialist to assist you. And, as all vets recommend, when introducing a new food into your pet’s diet, do so gradually. Doing so will give your pet’s digestive system a chance to get acclimated to the change in diet. For more information, please see the official Cook for Your Pets Day website.